Journalists are running from show to show, models are changing from one outfit to another and the designers are excitedly waiting for the audience’s reaction to their collections. In Paris, the fashion madness isn’t over yet, since everything is revolving around fashion week until Wednesday. In contrast, everyday life is slowly coming back to the metropolises New York, London and Milan, where people can recover from the stress of the last weeks. 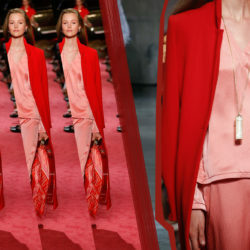 However, we’re still in the fashion week fever and are gladly providing you with the newest trends from Milan and Paris. The catwalk is covered in loads of pastel blossoms. Fine shoes with satin ribbons are wrapping themselves around the model’s ankles for a soft-footed appearance. Indeed, the attendees of the Dior show must have felt like part of a dance performance. The dark parquet, the strong eye makeup and the flowy black dresses reminded of a scene in Black Swan. 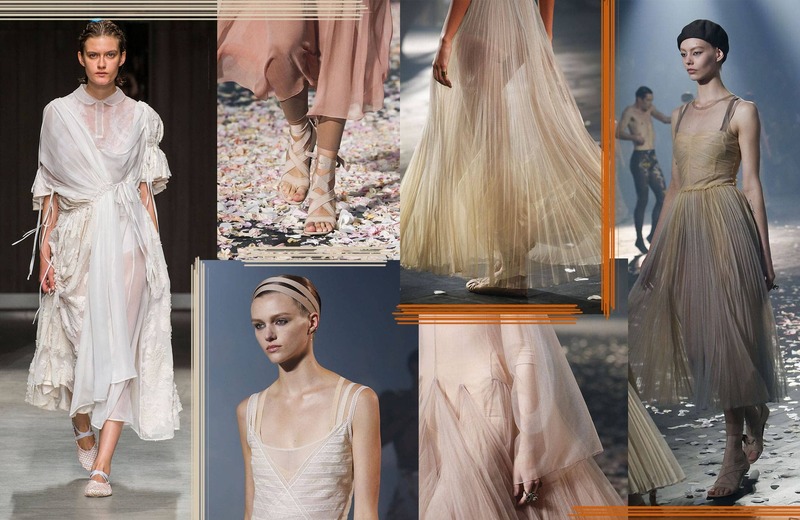 At the same time, some of the models were wearing white gowns and floated over the catwalk like pixies in soft beige tulle dresses. Dance and fashion have a close relationship – so Maria Grazia Chiuri banned tight corsets and stiff materials from this collection and concentrated on flowing materials, which are often found in modern dance. Also, the Japanese label Chika Kisada oriented towards dance for his spring collection and showed the classic ballet slippers in different colors and patterns. It seems as citrus fruits were a big source of inspiration for many designers this season. Lemon and orange were some of the most popular colors on the runway. The loud colors are eye-catching and make everyone smile. 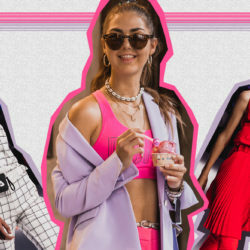 This happy mood is a fresh change to the very serious themes of the last couple months, which many designers have been incorporating into their collections lately. For now, however, Versace relied on a bright orange for jackets and coats. Other labels like Rochas or Moschino didn’t shy away from monochrome look in a fresh yellow tone. Dries van Noten was going a bit plainer on this trend, when he combined a bright yellow shirt with a white coat and some white trousers. 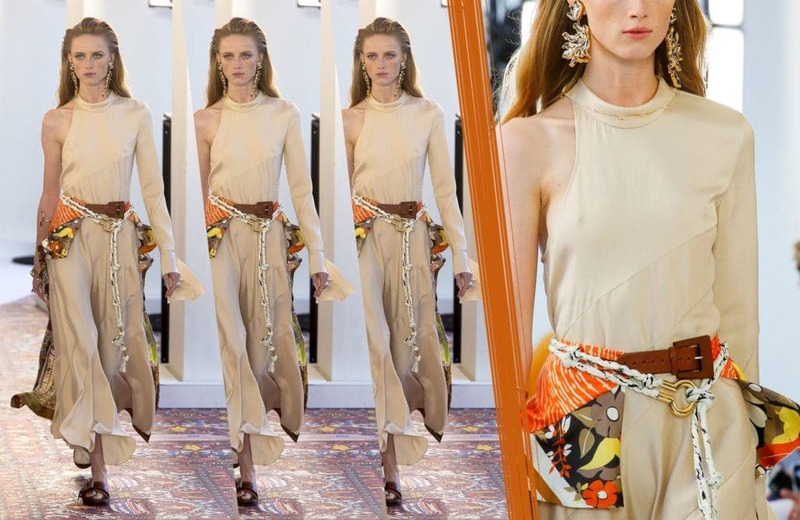 At Emilio Pucci, we saw a vibrant spring look with orange pleated pants. Strong women were already dominating the runways at the fashion weeks in New York and London. Apparently, they have become an important part of the fashion industry these days. Many designers were dedicating their collections to an independent and confident woman over the last seasons. After all, the strength of women cannot not only be expressed through their clothes, but also through their accessories. Therefore, the plainest outfits and even feminine dresses can look powerful. Just add in the right belt. Especially at Balmain, the belt was a big part of the whole collection. The so called “chain belts” were shown in many different colors and alternating with big silver waist belts. 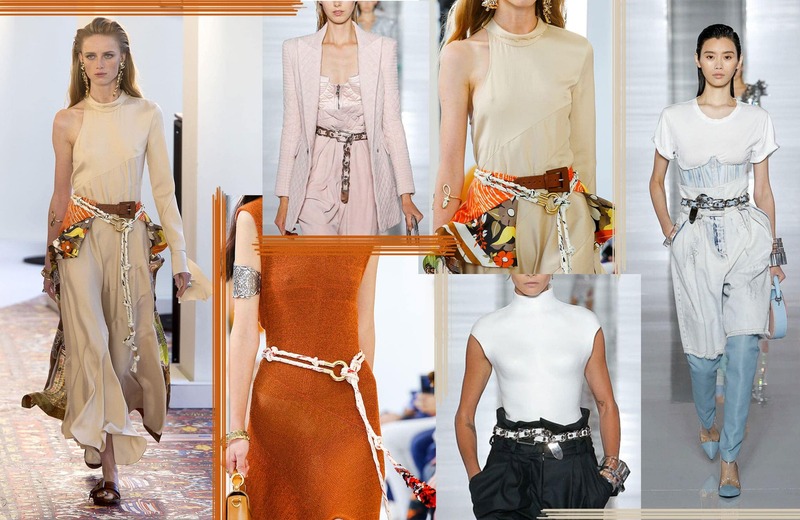 Chloé on the other hand, presented a more delicate version of the chain belt. Creative Director Natacha Ramsay-Levi gave her belts a hippie chic, by draping knotted cords around the model’s waists. The Italian designer Stella Jean even personalized the chain belts with colorful charms that spelled her name. You either hate them or love them – cycling shorts are currently splitting the fashion world. They have already gained popularity this summer, especially because of their wearing comfort. So, if you are not sure whether to love them yet, you will get the chance to decide. The cycling shorts will stay with us for spring 2019. But, they are getting upgraded into a smarter version. Miuccia Prada just changed the material of the classic cycling shorts into satin and voilà, the look could be worn at work as well. Salvatore Ferragamo was also presenting a very classic version of the sporty trousers. At Roberto Cavalli, Gigi Hadid could also attend an important business meeting in her runway look. However, Cavalli also reminded us that the original black cycling shorts can look very stylish with the right blazer and a good pair of boots. Did you miss the first part of the Fashion Week update? Click here to get the full overview! 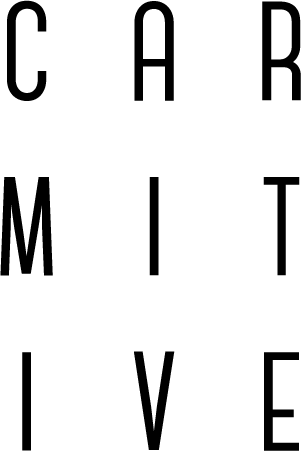 Posted in News and tagged Fashion Week, Inspiration, Lifestyle, Milan, Musthaves, Paris, Runway, Spring Summer 2019, SS19, Style, Things to love. Bookmark the permalink. Love the ballerina trend Carmen, so beautiful!!! Loved that yellow runway look. It’s so fresh 🙂 I love these new colors in Spring and Summer! The modern ballerina trend is so gorgeous and classic! I totally love it! So many chains in every show! Mostly when I watch fashion week, I’m looking at accessories. I am so excited for all the Loewe bags coming out!! Absolutely stunning looks. Thanks for sharing! I’m sooo excited for these trends. So fresh and unique, especially the Modern Ballerina. Thanks for sharing dear! These are top of the line outfits. All of them are definitely head turners. That citrus outfit is crazily good. Have a great week Katya! Thanks much for this useful post!